Pigeons Playing Ping Pong always brings the party. That’s what they do, and they do great job performing that task. 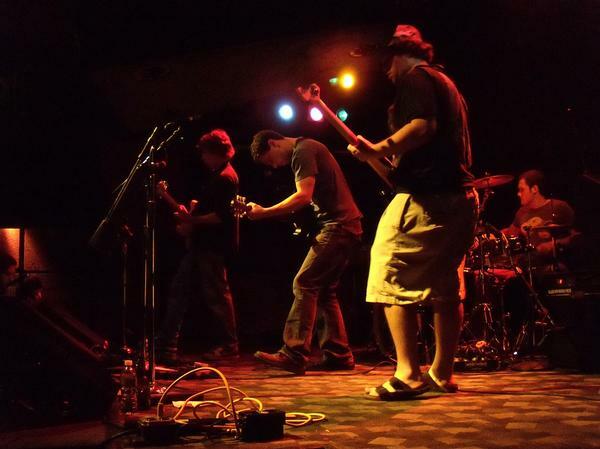 Based out of College Park, Md., Pigeons has been rocking the local music scene since 2007, performing over 50 shows from basement parties to Byrd Stadium, Maryland Terrapin’s football stadium. Pigeons is comprised of Jeremy Schon, guitar/vocals, Dan Schwartz, drums, Greg Ormont, vocals/guitar and Ben Carrey, bass. Fresh off of recording a new demo, FUNK E P, Pigeons Playing Ping Pong is working hard on building their fan base and elevating their jazz-rock sound to new heights. Pigeons Playing Ping Pong performs at the 8x10. Check out my conversation with drummer Dan Schwartz about the origin of Pigeons Playing Ping Pong and other features about this great local band. 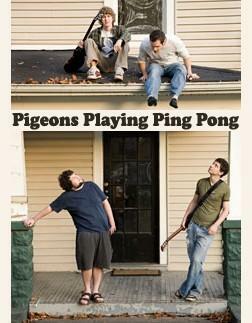 Q: When and how did Pigeons Playing Ping Pong form? A: Pigeons formed in the fall of 2007 when I agreed to jam with Greg/Jeremy, who were already doing the acoustic thing. We needed a place to jam, and Jeremy knew Ben from freshman year, so we all loaded our equipment into his house and he jammed with us and the connection was made. Q: What is the reasoning behind your band name? A: The name is based on an actual BF Skinner science psychology experiment on using a reward system to train pigeons to play ping pong. Plus, it’s highly marketable and sweet alliteration. Q:What are some of Pigeon’s biggest influences? A: Our top influences right now include Lotus, Phish, Soulive, New Deal, New Mastersounds, Perpetual Groove and the entire 90’s rock genre. Q: How would you describe your band’s sound? A: Funk/Rock/Jazz/Dance band that Jams. We don’t want to be pigeon-holed (pun intended) as a Jam Band. Q: What has been your biggest show to date? What made that show so special to your band? A: Our biggest show was our CD release party in February at the Santa Fe Cafe. The night was sold out and the energy was incredible. It was a culmination of a lot of hard work we put into the album and a lot of word of mouth buzz we generated. It was great seeing all our friends get into it. Q: You guys just finished recording your demo FUNK E P. How was the recording process? A: We recorded the entire album as a live instrumental take in one night at WMUC studios courtesy of engineer Ilia Kobrinsky. Then, Jeremy overdubbed crucial guitar parts and solo’s and Greg did his vocals over the instrumentals. Ilia then mixed and mastered the album over the next week or so. “Couldn’t We All” started with a beat I had made on Reason. Q: Where do you hope to see Pigeons Playing Ping in a few years? A: Our goal is to play All Good 2011, and Madison Square Garden 2012. You gotta have big hopes. Q: Any tips and advice for local bands through your experiences to date? A: Develop your sound. Master your craft. Then, learn the ins and outs of the business and use your creativity to make your presence known on a local level. Most of all, make sure you can have fun doing what your doing, because once people see you’re into it, it becomes infectious. Pigeons Playing Ping Pong will be rocking the 8×10 next Thursday, March 25. If you want to dance and have a good time, Pigeons is the band to see. Support this awesome local band. 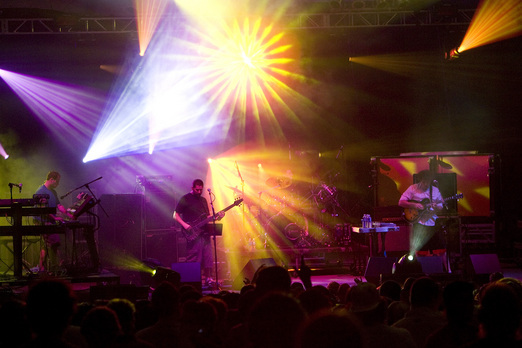 The 12th annual Starscape Festival will feature electronica powerhouses Disco Biscuits (pictured), Lotus, Pretty Lights and the New Deal along with plenty of of other impressive acts. The festival, sponsored by Ultraworld, will take place at Baltimore’s Fort Armistead Park and will host four performance areas, including stages and DJ tents. Along with the music, Starscape will also feature an extensive art gallery for all to check out. Starscape Festival will take place on June 5 and into the early morning hours of June 6 from 2 p.m.- 6 a.m.
Tickets are already on sale, and you can buy them online or at a select retail store.